These sleek townhome style condos have garages under the main levels. Inman Green's design elements continue throughout the units and end with their amazing roof decks. Inman Green is a community of lofts and townhomes in Inman Park. These new homes are Green Certified which means they conserve resources and energy by up to 30%, have improved air and water quality, use efficient and reliable Energy Star appliances, and reduce waste to both landfills and owner costs! Inman Park is a tight community with an active neighborhood association. This historic neighborhood is a destination for many and is also just minutes from Downtown Atlanta attractions. Other unique green features include a roof top deck with vegetation, water conserving plumbing, recycled insulation and countertops, dual flush toilets and tankless water heaters. The drought resistant landscaping also means that the community stays beautiful without wasting precious water resources. 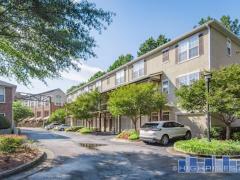 Inman Green encourages the use of bicycles and plenty of racks are available but should you choose other modes of transportation, you are close to Marta and each unit has 2 parking spaces. Have any comments or questions about Inman Green Lofts? Ask your question and/or share your thoughts about this Building.